With the RotaTrim M42 Professional trimmer you can cut and trim a variety of paper and other materials with it's extra long reach. The RotaTrim M42 42" reach and flexibility will perform for you time and time again! Rotatrim is recognized globally for producing the best trimmers, unmatched in accuracy, reliability, and safety. These large professional paper cutters accurately trim large drawings, posters, and other graphics saving valuable time and money. They are popular in the photography and graphics industry for precise trimming of graphics. Designed for architectural firms, city planners, government planners, print shops, professionals, photographers, schools and educational classrooms, media design / graphics design artists and much more! Increased cut capacity, designed for every day continuous use. 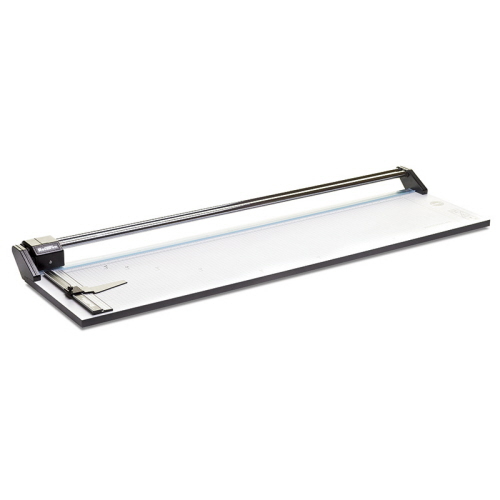 Twin chrome steel guide rails completely eliminate head swivel whilst delivering a smooth gliding action. Metal end frames and head. Transparent clamp strip for accurate work placement. Cut Length (mm / inches) 1068 mm / 42"
Paper, posters, card stock, photo print and drawings, wrapping paper, roll core sheet material and a host of other printed and non-printed materials including: Canvas, Card, Cellophane, Cork, Corrugated Card, Craft Paper, Crepe Paper, Newsprint, Digital Prints, Felt, Floor Graphics, Foil, Heat seal, Honeycomb, Ink-jet Paper, Laminations, Mount board, Photo Film, Polyester, Polystyrene, Posters, Reflective Film, Self Adhesive Film, Tissue Paper, Transparencies, Veneers, Vinyl. RotaTrim M42 42" Trimmers are hand built by highly skilled technicians so you can be assured of the absolute highest quality of craftsmanship, accuracy and reliability. The Rotatrim M54 is the largest size in the Professional 'M' Series range and will comfortably cut materials up to 54" (1374mm) in length, large enough to easily accommodate A0 landscape. This wide format 36" width RotaTrim M36 is a Professional model design for longer material trimming and cutting tasks. The medium media format RotaTrim M30 Professional for wider, larger cutting tasks requiring extended width trimming. The Medium Format RotaTrim M24 Professional is designed for larger size paper and other media trimming tasks requiring precision.